This section is from the "Handicraft For Boys" book, by A. Frederick Collins. Amazon: Handicraft for boys. To make a magic lantern out of a camera is just as easy as it is to make a reflectoscope but you will have to buy a condensing lens58 and this will cost 50 cents to $1.00, according to size. For this lantern you can use either a box or a bellows camera, though the latter is better because the picture can be focused. Whichever you use make a base of a 1 inch thick board, 5 1/2 inches wide and 14 inches long and nail or screw two strips of wood 1/2 an inch wide, 3/4 inch high and 8 inches long along the edges on one side as shown at A in Fig. 60. If your camera is of the box kind set it in between the strips on the base on the front end, but if it is of the bellows type then you will have to make a shelf for it as shown at B to hold the camera in place as shown at C.
58 The L. E. Knott Apparatus Co., Boston, Mass., sells a 2 inch condensing lens for 50 cents; a 3 inch one for 75 cents, and a 4 1/2 inch one for $1.10. 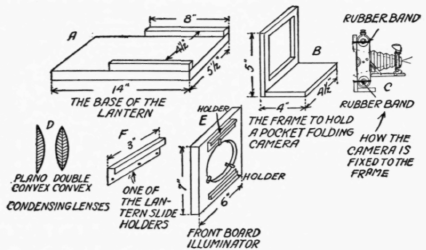 Next make an illuminator as described above in the text How to Make an Enlarging Apparatus, but instead of covering the front with ground glass make a board to fit it and cut a hole in it the exact size of the condensing lens. This lens is a piano or a double convex lens as shown at D and while it should be 4 1/2 inches in diameter to get all of the picture on the screen you can use a lens as small as 2 inches though all of the picture will not show. Cut out six clips of sheet brass 3/16 inch wide and 1/2 an inch long and punch a hole in the end of each piece. Screw three of these clips to each side of the board at equi-distant points around the hole so that the end of each one projects over the edge of the hole 1/8 inch. Now put the lens in the hole and adjust the ends of the clips so that they will hold the lens in place as shown at E.
The next and last thing to do is to cut two strips of tin or brass 1 inch wide and 3 inches long and bend each one over the long way as shown at F; punch three holes near the lower edge of each one and screw one of them above and one below the condensing lens on the board 3 1/4 inches apart as shown at E. These bent strips form the holder for the lantern slides. The magic lantern complete is shown at G.
Tack a bed-sheet up on the wall; turn on the light in the illuminator and turn off all the lights in the room; slip a lantern slide upside down in the holder and then push the rear end of the camera - having first taken out the back - close up to the lantern slide holder. If you are using a box camera move the whole lantern back until the picture is as large as you want it and it is still bright enough. If it is a pocket folding camera you can focus it and get a picture with much better definition. To make lantern slides by direct contact printing is not a hard thing to do at all, and all the equipment you need to make them besides the chemicals is a printing frame. Put a sheet of clean glass in it and lay your negative on it with the film side up. Now lay the lantern slide plate 60 with the film side down on the negative just as though you were going to make a print, but you must make it in your dark room, using a white light to expose it of course, for it is just as sensitive as a dry plate or a film. When you expose it hold the printing frame about 12 inches away from the light. A lantern slide plate is developed, fixed and washed exactly like a dry plate but to get the best results you should use the kind of developer called for in the directions that come with the plates. When you have the lantern slide made, place a sheet of clear glass of the same size - called the cover-glass - on the film side of it and bind the edges with passepartout binding, that is a strip of paper gummed on one side. It is then ready for use.